The Nespresso Vertuo Plus is a convenient and easy-to-use coffee machine that creates great-tasting coffees of all types and sizes, the main downside being that it also creates a large amount of waste that it's not always simple to get rid of. The so-called ‘George Clooney effect’ has meant more and more households are adding a coffee pod machine to their morning routine. 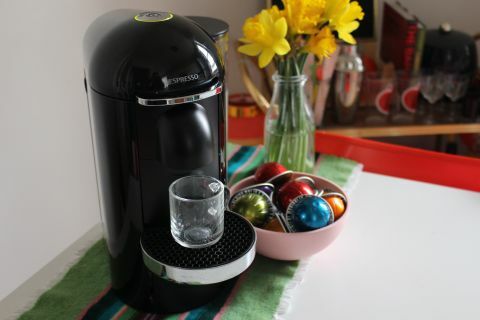 And after a month with one in residence, it’s easy to see why: the Nespresso Vertuo is compact, neat and convenient, and after choosing the flavor and size from a (slightly) mind-boggling array of multicoloured pods, your coffee is ready at just two touches of a button. With such a streamlined product, you could forget you were making coffee in the first place, until you come to dispose of the pods themselves. It’s sleek, it’s pretty self-contained, and there are few kitchens, living rooms or offices you couldn’t sneak one of these into. Nespresso’s coffee pods have had a makeover too, the Vertuo system uses enticing colors, and while the machine looks pretty low-key, it’s deceptive. Clicking the silver leaver at the front raises the top of the machine, where you leave the coffee pod to spin up to 7000 times a minute to blend ground coffee and water to produce the perfect crema. The tiny dashes on the sides of the pod are actually a barcode - the machine reads this to tailor its blending technique to suit the capsule, with three pods and four drinks sizes now available. The Centrifusion brewing process uses centrifugal forces (high speed spinning) to extract flavur. Brewing parameters are adjusted for each capsule, using the barcode data to regulate the flow and volume of water, as well as temperature, infusion time and capsule rotation speed, which is a process Nespresso says helps to produce a lovely rich crema. The Vertuo Plus also has a moveable water tank (surprisingly useful if you’re finding somewhere to house this in an office or in your flat) and the capsule lever closes automatically. Nespresso’s Centrifusion method is worth the hype. We tested this machine for a month and the extraction technique worked every time, without fail. Coffee machines that go easy on an un-caffeinated mind are always going to curry favor, and you could probably use this machine with your sleep mask still on. It’s so easy, it’s not even rude to ask guests to help themselves. But it’s hard to get away from how keen Nespresso is to lock you into its way of doing things (it’s not called a system for nothing). For starters, the Vertuo machine will only read Nespresso pods, so there goes the old loophole third parties have been using since their coffee pod patent expired in 2011, meaning no last-minute trips to refresh supplies. And they’re not cheap either. At around 60 pence/80 cents per pod, a morning espresso habit could soon add up. Nespresso is also keen for you to only use its branded cups and mugs. An attempt to go rogue and use a slightly smaller espresso cup (the standard size is 25ml) will mean you’re stopping the brewing process halfway through extraction, so you’re not getting the most out of the (pretty pricey) coffee pods you’ve bought. So as much as the Vertuo machine tries to do everything for you, you get the feeling it sometimes tries too hard. There's no getting around it, the Vertuo pods make great-tasting coffee. From crema to decent espresso and long blacks, it gets close to doing it all. And there’s no “adding two pods to get a bigger coffee” vibe of pods of yore. The Vertuo has been designed to offer four sizes of coffee: the Alto (414ml/14oz), the straight-up Coffee (230ml/8oz), the Gran Lungo (150ml/8oz) and the 40ml/1.35oz (Espresso). No, milk isn’t really included in the thought process here (for instance, you’ll need a HUGE cup (bucket?!) to house any milk after pouring out a 414ml/14oz Alto coffee), but the coffee the Vertuo makes is pretty tasty without it. I found myself adding less and less milk as the weeks went by, as I liked the specific flavors of the coffee so much. On to the pods in question: the dregs of leftover coffee remaining in the pod make them difficult to process in standard municipal recycling plants. Nespresso has defended its use of aluminium, saying it helps keep the coffee fresh, and that aluminium is infinitely recyclable. Online, you’re encouraged to add recycling the pods into your ‘coffee ritual’, which is possible by taking them to a CollectPlus store to be taken away if you're based in the UK, or straight to a Nespresso boutique. If you're based in the US, Nespresso has teamed up with UPS so now users can throw their pods into a pre-paid UPS bag and drop them off at any UPS pick-up location, local office depot or Staples. But the idea of carrying a bag of used coffee pods to work so you can dash to a Nespresso boutique, a UPS point or a CollectPlus store on your lunch break is quite a big trade-off to the convenience of the coffee itself. Using council or local collection services is Nespresso’s long-term ambition for recycling pods, but those pods still have to be driven to a processing plant, so it all starts adding up. It’s all well and good being able to offer every coffee option under the sun to guests on a hungover Sunday morning, but introducing that much waste into your life, that wasn’t there before, feels, well, completely irresponsible. If you’re looking for a new coffee machine for your workplace or to share with your housemates, or any scenario where you’re getting through a lot of coffee, the Vertuo is a great fit. It’s convenient, neat, reliable, easy and it creates gorgeous coffees, day after day, with minimal effort from a would-be barista. The only main downside is the environmental impact, and it’s big: you’re creating a lot of waste here. But if you’re ready to sign up to the Nespresso way of thinking, and get a decent recycling system in order for those pods, then you could make this work for you. The only other issue with Vertuo is that it goes to such lengths to be convenient that after a while, the method begins to feel quite sterile. If you love the smell of fresh-ground coffee in your kitchen in the morning, look elsewhere. But if it’s convenience and speed you need, you’ll strike gold.